Expectations are high for CANNIBAL CORPSE's 10th full-length studio release to be as heavy and twisted as anything the seminal death metal band has ever done. "Kill" easily met my expectations and should meet yours as well. Then again, the band does not make bad albums. Simply put, "Kill" is an excellent slab of vintage Corpsegrinder-era derangement. The songwriting and musicianship on 2002's "Gore Obsessed" and 2004's "The Wretched Spawn" are unequivocally worthy of praise. One cannot go wrong with ferocious songs like "Pit of Zombies", "Savage Butchery", "Dormant Bodies Bursting", "Severed Head Stoning", and "Decency Defied". It is not that the songwriting on "Kill" is infinitely better. There is just something about the precision attack of the compositions and the sheer viciousness of the delivery that makes "Kill" sound like more of a CANNIBAL classic every time I spin it. Maybe some of it has to do the mix of thick and gooey bass licks and sickeningly crunchy guitars that producer Erik Rutan has skillfully captured in the studio. It could be the furious pace or the lethal chord progressions of Pat O'Brien (who rips out some lacerating solos) and the new/old guitarist Rob Barrett (who also played on "The Bleeding" and "Vile"). George "Corpsegrinder" Fisher's patented screams and distinctive growls might even be more psychotic this time around. In fact, it is probably all of those things and then some. "Kill" also gets better with repeat listens, a sign of lasting quality. "The Time to Kill is Now" is the perfect opener. It is as speedy and insane a two minutes that you will ever hear from CANNIBAL CORPSE, and Rutan helps make it so by contributing backing vocals. Several tracks are already beginning to sound like classics to these ears, most notably the fat crush and tricky tempo shifts of "Necrosadistic Warning". It is the album's most memorable track (at least right now). "Make Them Suffer", "Five Nails Through the Neck", and "Purification By Fire" are close behind, the arrangement of all three frantic, unsettling, and difficult to rid from the dark recesses of the mind. The more you listen, the more you'll begin to appreciate the six-string intricacies of O'Brien and Barrett as well. For example, "The Discipline of Revenge" features smartly constructed chord progressions and some particularly ominous O'Brien/Barrett harmonizing. The O'Brien-penned instrumental "Infinite Misery" closes the album in an appropriately strangulating manner. "Kill" is the sound of a band that is out to prove that it is still among death metal's elite. 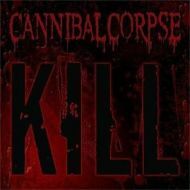 Technically proficient, eminently memorable, and gorged with entrails, "Kill" is quintessential CANNIBAL CORPSE.